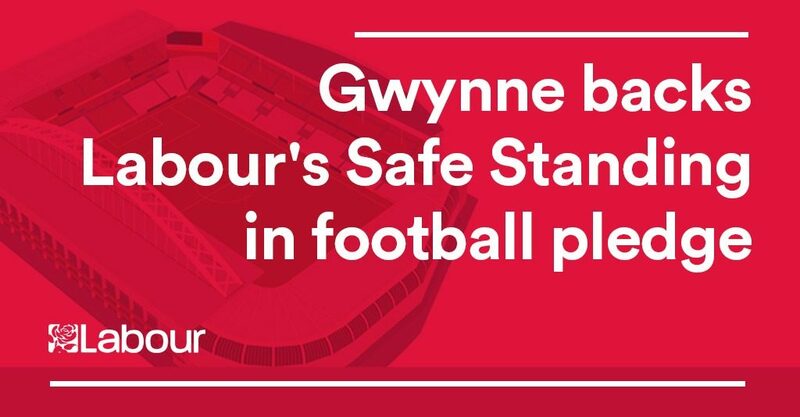 Denton and Reddish MP, Andrew Gwynne has today backed the Labour Party’s announcement that a future Labour government would introduce safe standing in football stadiums across the country. Today, Friday 8th June, at Queens Park Ranger’s Loftus Road Stadium, Labour has announced it is backing the introduction of safe standing at football. Labour’s Shadow Sports Minister, Dr Rosena Allin-Khan MP, announced that the decision to introduce Safe Standing should be devolved down to clubs, fans and safety authorities. Last year, Labour pledged that all sports should be inclusive for all – by giving fans and supporters the opportunity to have a greater say in how their clubs are run. Dr Rosena Allin-Khan MP and Gwynne support giving fans across the country the power to decide what is safe for the future of their club. During the last few months, Labour has consulted with clubs, supporters’ clubs and trusts, safety authorities, and leagues to undertake a review of opinions around Safe Standing in football. Labour says the number of designated safe standing spaces would be capped at 7,500 per stadium, which is in line with what the English Football League have proposed. The policy does not apply to lower league clubs, such as League One and League Two, where safe standing is common. “Through this policy we want to give fans the power to decide how they want to watch their football club.